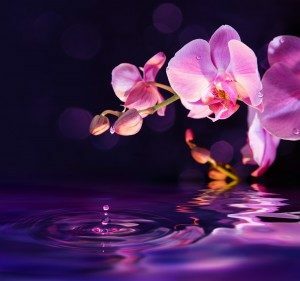 Orchids are some the most highly coveted decorative plants due to their delicate, exotic, and graceful representations of love, luxury, beauty, and strength. In ancient Greece, the flowers were associated with virility. Greek women believed that if the father of their unborn child ate large orchid tubers that the baby would be a boy; if the mother ate small tubers, it would be a girl. In traditional Chinese medicine, orchids are used to cure coughs and lung illness. The Aztecs were said to drink a mixture of the vanilla orchid and chocolate for power and strength. In the Victorian era, the symbolism of orchids came to mean luxury, and today these flowers are seen as a rare and delicate beauty. In contemporary society, they are the 14th anniversary flower. Pink orchids convey pure affection, and the popular cattelya orchid means mature charm. Over 25,000 different kinds of orchids exist in nature, making them one of the largest in the family of flowering plants, but they have always been viewed as a rarity. Food and flowers are an integral part of my personal brand. When I was in the corporate world, I tended to be stern and demanding when it came to the individuals I managed. With these two items, I could encourage people to view me as hospitable instead of mean and unapproachable. Orchids are my flower of choice. For me, they represent doing what you love and being comfortable in whatever environment you choose to do it in. My personal brand represents the values I try to consistently deliver to those I serve. So, my trademark is chocolates, butterscotch, and of course, orchids. What will yours be? If you would like assistance crafting your personal brand, I invite you to contact me, Carroll King Schuller of Organic Blueprints, Inc. at 804.288.0099. Stop by to smell the orchids and have a piece of candy!